If slideshow doesn't work, click here. You can say this much about the New Orleans Pelicans' new uniforms: The guys at the scorer's table are going to love them. The team, formerly known as the New Orleans Hornets, unveiled its new uniforms Thursday afternoon. In a somewhat surprising move, the word "Pelicans" is nowhere to be found on the home or road jerseys, both of which feature a "New Orleans" wordmark. Even odder, the city name is rendered in very small lettering, which allows the front uniform numbers to be larger than usual. Refs and scorers will have no trouble telling one Pelican from another. The small "New Orleans" lettering feels too low-key, almost like the uniform for a high school team. It also creates the odd situation of the players' names on the back of the jerseys being larger than the city name on the front -- a possible NBA first. NBA teams aren't allowed to have alternate uniforms during their first season of operation, so the Pelicans will stick to their home whites and road blues for the coming season. They plan to add an alternate for 2014-15, with yet another alternate (maybe a Mardi Gras design?) the season after that. Until then, we'll have to live with this rather underwhelming set. 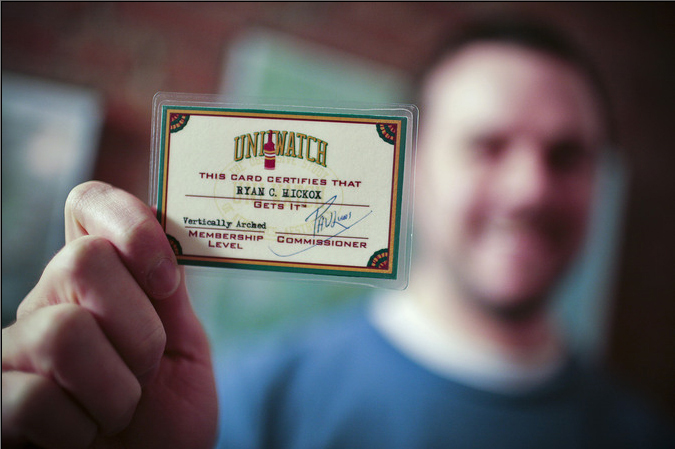 Paul Lukas is the founder of Uni Watch. If you liked this column, you'll probably like his daily Uni Watch website, plus you can follow him on Twitter and Facebook. Want to learn about his Uni Watch Membership Program, be added to his mailing list so you'll always know when a new column has been posted or just ask him a question? Contact him here.